Wales captain Ryan Giggs was named Welsh Footballer of the Year at Tuesday's awards dinner at Cardiff's Millennium Stadium. The 32-year-old Manchester United superstar has been outstanding for club and country in the last 12 months. Lewin Nyatanga took the honour of Wales' Young Player of the Year, pipping Joe Ledley and Gareth Bale. Derby defender Nyatanga, 18, has continued to impress since making his debut against Paraguay last March. In that 0-0 draw with the South Americans Nyatanga became Wales' youngest ever player, although his mark was bettered by Southampton's Bale in May against Trinidad & Tobago. Wrexham midfielder Mark Jones won the Welsh club player of the year prize, with Swansea's Owain Tudur Jones and Ledley of Cardiff the other front runners. Wrexham groundsman Johnny Edwards also claimed a gong for services to Welsh football. Danny Gabbidon took the main award last year, with James Collins the young player of the year and Sam Ricketts winning the club honour. Giggs' hamstring injury will keep him out of the home Euro 2008 qualifier against Slovakia on Saturday and probably against Cyprus four days later, also in Cardiff. 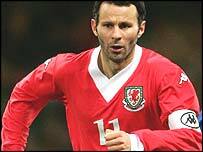 It is only the second time in his career that Giggs has won the top award he first lifted 10 years ago, despite being considered the best Welsh player of his generation. "Ryan is fully deserving of this award," said national manager John Toshack. "Since I made him captain, his attitude and form for Wales has been exemplary."